Published: Jan. 6, 2019 at 02:49 p.m.
Los Angeles Chargers cornerback Desmond King starts the second half with a bang as he races all the way down to the Baltimore Ravens' 26-yard line for a 72-yard return. Published: Jan. 6, 2019 at 01:41 p.m.
Los Angeles Chargers cornerback Desmond King weaves through the Baltimore Ravens and takes the ball all the way to the Ravens' 42-yard line. 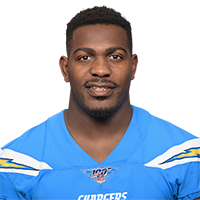 Published: Dec. 2, 2018 at 10:45 p.m.
Los Angeles Chargers cornerback Desmond King zig-zags across the field for a punt-return touchdown.